A variety of onion, the scallion (Allii fistulosi) is a pointy-leafed perennial that can reach about 20 inches in height. The herb has been a popular remedy in Asian folk medicine for thousands of years, having been first described about 2,000 years ago in the Chinese herbal classic Shen Nong Ben Cao Jing. The plant, which flourishes in warm climates, is native to Asia but has been found growing in many parts of the world. While the scallion’s fresh bulb is the part that is most often used as a drug, the entire plant is believed to have medicinal properties. Scallion, which belongs to the Liliaceae family, is sometimes called green onion, spring onion, Welsh onion, or Japanese bunching onion. The scallion bulb is called Cong Bai in Chinese and the root of the scallion is called Cong Xu. While not approved by the Food and Drug Administration (FDA) or widely used by Western herbalists, scallion is believed by Eastern herbalists to possess a number of important properties. Often used to treat the common cold, it is also believed to fight fungal and bacterial infections and to cause or increase perspiration. The herb may also act as a metabolic stimulant. Because scallion has not been studied extensively in people, its effectiveness is based mainly on the results of animal and laboratory studies as well as its ancient reputation as a folk remedy. In a 1999 investigation, scallion was shown to block the growth of several types of fungi. In a 1998 study, scallion extract was shown to inhibit the activity of Aspergillus niger and Aspergillus flavus. In a 1985 Chinese study of scallion’s antibacterial properties, the herb was shown to be effective against microorganisms such as Pseudomonas aeruginosa and Micrococcus luteus. Exactly how scallion works is unknown. Its therapeutic effects (as well as its pungent flavor) are often attributed to the herb’s volatile oils, which include sulfurous compounds such as allicin, dipropyl disulfide, and allyl sulfide. Allicin may be of particular importance. This agent, also found in garlic (Allium sativum), has been shown to fight bacteria and fungi, help prevent atherosclerosis, lower cholesterol levels, and act as an antioxidant. Other constituents of scallion include starch, sugars, cellulose, fatty acids, pectin, and vitamins A and C.
In the philosophy of Chinese folk medicine in which diseases are often believed to result from disruptions in the flow of bodily energy, scallion is considered warm and acrid. 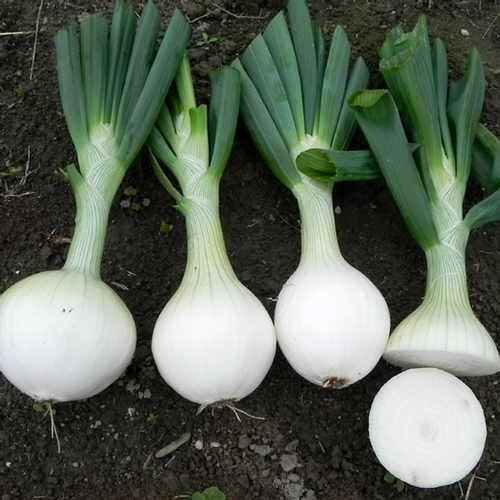 The whitish bulb of the scallion, called Cong Bai by Chinese herbalists, is mainly used to treat the common cold. Often combined with other herbs, it may be used to shorten the duration of a cold or alleviate symptoms such as runny nose, fever and chills, nasal congestion, and headache. It is also recommended for diarrhea, stomachache, abdominal bloating, earache, mastitis (breast inflammation), pinworms, kidney stones, carbuncles, urinary difficulties, and sores or abscesses. In a more general sense, the bulb is believed to improve digestion, remove impurities from the body, and restore vital functions. While the bulb of the scallion is usually favored, other parts of the plant have been used to treat a long list of maladies. The roots, called Cong Xu in Chinese herbalism, are sometimes recommended for cold-related headaches, throat sores, and frostbite. The leaves are employed to treat cold symptoms, carbuncles, stroke, and traumatic injuries. Scallion seeds are reputed to enhance vision and improve kidney function. They may also be used to treat dizziness as well as impotence due to kidney problems, among other health complaints. Juice derived from the bulb (or from the whole plant) is thought to detoxify the body and thin the blood. It may also be used for nosebleeds, headaches, carbuncles, hematuria (the presence of blood in the urine), internal parasites, and traumatic injuries. Some of the more intriguing research related to scallion has been conducted in China and Japan. One Japanese investigation focused on scallion and the common cold. In the study, which involved 107 people suffering from colds, equal amounts (15 g) of scallion bulb and ginger were combined with a few grams of salt. The mixture was applied externally to a number of areas on the body, including the back, chest, palms, and soles of the feet. All of the study participants treated with the scallion mixture recovered in a day or two. 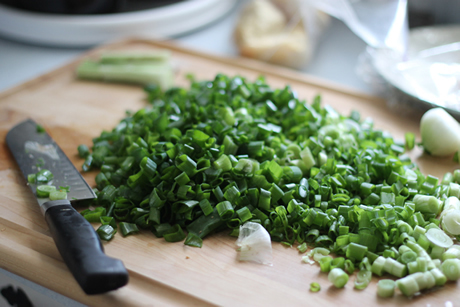 One application of scallion was usually sufficient to achieve results, though a few people in the study required two treatments. In several instances, the mixture reduced fever completely within half an hour. An enema prepared by combining scallion, ginger juice, and pinellia root may be helpful in treating acute mastitis (breast inflammation), according to one study. The optimum dosage of scallion has not been established with any certainty. 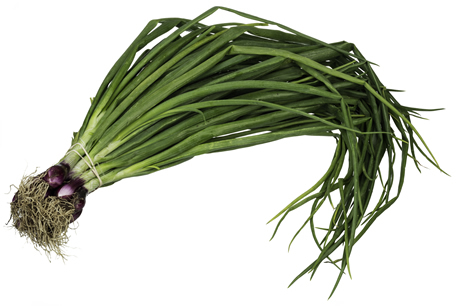 When scallion bulb is used internally, the dosage is typically 9–15 g a day. A preparation can be made by boiling scallion in water or wine. Mashed bulbs can also be applied externally to an affected area of skin. When other parts of scallion (such as the leaves, roots, and seeds) are used internally, daily dosage is 3–15 g. Like the bulbs, scallion’s leaves and roots may be applied externally. Tablets containing scallion in combinations are also available. Scallion may be included in the diet. The herb is a favorite ingredient in Chinese cooking, where it is used in raw and cooked form. Because scallion has been recommended for a variety of purposes and can be used internally and externally, consumers are advised to consult a doctor experienced in the use of alternative remedies or Chinese medicine to determine proper dosage. Scallion is not known to be harmful when taken in recommended dosages. It is important to note that the long-term effects of taking the herb (in any amount) have not been investigated. Due to lack of sufficient medical study, scallion should be used with caution in children, women who are pregnant or breast-feeding, and people with liver or kidney disease. The volatile oils present in the herb may cause skin irritation or eczema in susceptible people. Because scallion can increase sweating, people who are perspiring heavily should avoid this herb. When taken in recommended dosages, scallion is not associated with any bothersome or significant side effects. Scallion should not be combined with honey, according to some practitioners of Chinese folk medicine. When used internally, scallion has been mixed with ginger, white pepper, and pig’s feet without apparent harm. When used externally, scallion has been safely combined with a variety of other herbs, including ginger and powdered fennel seed.